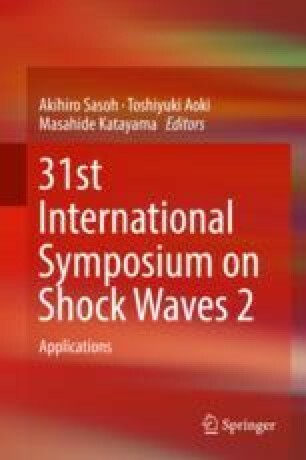 In this paper we present work in progress and preliminary results from experimental studies of shock propagation through particle-laden gas columns. The experiments are conducted in a double-driver shock tube. The tube has a total length of 8.6 m. A setup with a double-driver chamber is chosen, as results clearly demonstrate high degree of repeatability. In order to obtain relatively short shock durations, the total length of the driver section is only 0.12 m. Pressure gauges and high-speed cameras are used to measure the results. A specially designed window section together with high-speed video cameras equipped with telecentric lenses and illuminators allows the shock-particle interaction in directions perpendicular to each other to be captured.